Wagner Transformed (60'29") is not just another computer-science project - one where a DJ stretches or recycles some classical music into something vaguely recognizable of the original. 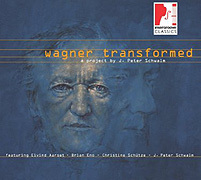 Wagner Transformed might be beyond category. Assembling a harmony of talents J Peter Schwalm guides a number of associates and musicians in a fascinating metamorphosis of the music of Richard Wagner. Basing their realizations on original scores this outfit produces 13 tracks worth of deconstructed interpretations, rearranged structures and reduced essentials meant for the present-day. In collections where several talents are involved, unevenness is somewhat built in. As one piece concludes another begins. Yet over and over the dream-like flow that most listeners expect here will never be interrupted. Each brief segment sets up expectations that its successor ingeniously fulfills or surpasses. In a few spots there are piano works which seem from straight off of the sheet music. As under appreciated nuances give way to the experimental, the staccato crosscutting of electronic and rhythmic works propels Schwalm's affair into elegant ambient instrumental space. Amid a pleasing digital glow, soft halting beats pulse beneath intriguing and minimal piano melodies. Equally present are Wagner derived soundscapes. At once coarse yet fragile, desolate yet majestic, complex yet innocent these zones offer as their main object the manipulation of texture and the color of sound. In one sitting Wagner Transformed provides us with pleasant chamber pieces, jumpy electro themes, moaning soundscapes of exhilarating immediacy and ethereal electric guitar gestures of an instant prolonged. Everything that is happening on this album is not happening in the single musical moment in which we are listening. Some of it is taking place in the midst of our present day, and some of it is taking place at the beginning of the 20th century - in the ideas of a great and transforming musical mind.